The Veda itself is called śruti for two reasons. (1) It was heard (śruti), not “authored.” This is why it is called apauruṣeya (unauthored). Accurate perception of reality (“knowledge” / Veda) exists intrinsically with reality itself, it is not separately created. (2) The sound (śruti) of it is very important, and very strict grammatical rules are in place to insure that any changes or curruptions to the mantra sounds can be detected and corrected. By the second paradigm, the purāṇa and itihāsa are not to be considered śruti. They are part of another branch of the Vedic library: smṛti (thought, where the concept has precidence over the verbal form it is expressed in – so the verbal form can expand and contract as various narrators narrate the texts). By the first paradigm, the purāṇa and ihihāsa are indeed to be considered śruti – because they are a “fifth part” of the original Veda put into words originally by Śrī Brahmā. The phrase, “All of these originate from the original, single Yajur-veda.” indicates that the Purāṇa are as much a part of the original Yajur Veda as are the four divisions bearing the names Ṛg, Yajur, Sāma, and Atharva. 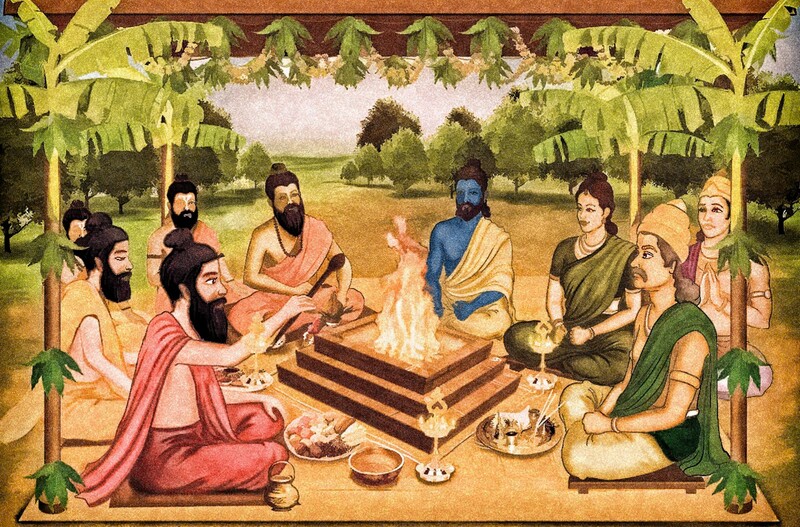 The portion of the original Veda that did not have a place in the organization of four components of sacrificial became the four-hundred thousand verses of the Purāṇa distributed among mortals. Argument: No Way! No How! Some argue that the Purāṇa are not śruti in any sense of the word. If that were so, why does their very name imply that they embody the complete śruti? It is said, “Because they complete (pūraṇa) the Veda, they are called Purāṇa.” Just as one cannot complete a gold bracelet with lead, one cannot complete the Veda with something non-Vedic. The fact that the traditional method of studying the Veda includes study of the Purāṇa also proves that the Purāṇa are Vedic. These quotes are from Śrī Tattva Sandarbha, according to my translation, in a book I have published called, Basic Truths of Gaudiya Philosophy, as a result of studying it with Śrī Satyanārāyana Dāsa Bābājī who is the foremost specialist in Śrī Jīva’s Bhāgavata Sandarbha. The next section of Śrī Tattva Sandarbha goes on to present pramāṇa that the Purāṇa are currently more reliable than the other parts of the Veda. I encourage the inquisitive reader to study this book very carefully. Previous How to Make Sādhana More “Natural”? I have your book. It’s a very useful and handy little book that serves as a perfect introduction to Srila Satyanarayana Dasa Babaji’s Tattva Sandarbha. Are you by chance intending to write on the other sandarbhas? Thank you. Yes! I really intend to do the same for the other five sandarbhas. Could you please present the Sanskrit for the quotes from the Sruti about puranas. I tried looking for the first one in Tattiriya Aranyaka and it did not exist.